The best fish amok in town! Cambodia is truly a kingdom of wonder. Not only are the views magnificent, but also the food. 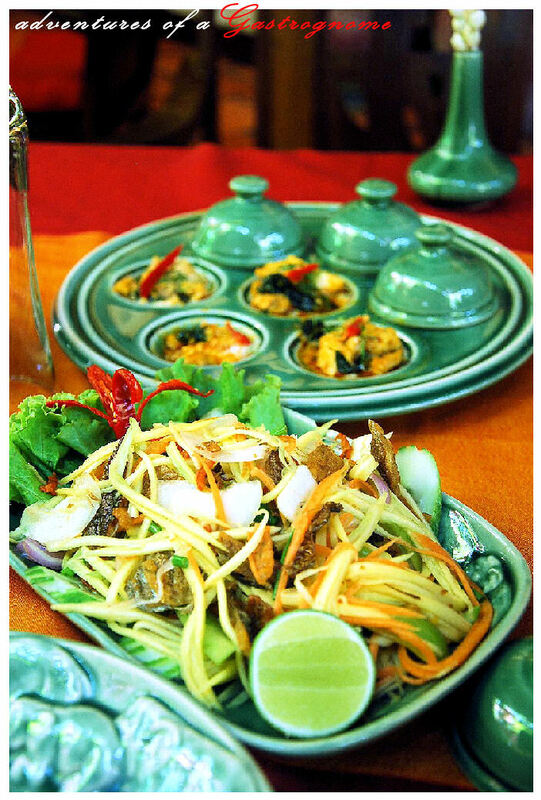 Prior to my visit in Cambodia, I’ve read a lot of reviews saying that Cambodian or Khmer cuisine is not interesting and that it’s boring. Contrary to what they say, I found Khmer cuisine really charming! Khmer cuisine is sooo fragrant to the point that it’s stimulating! Like the pungent Kampot pepper coupled with lime juice; or the combination of Kaffir leaves, lemongrass and turmeric; or the fusion of tamarind’s tang with coriander, turmeric and lemon basil. Just thinking about these makes me real hungry! Aside from the fragrance, there’s also the matter of contrasting textures which is often amusing—well, for me. But what made me love Khmer cuisine is the way they prepare their curry. I’m not fond of curries and food with coconut milk that it’s almost a hit-or-miss experience, however, I found Cambodia’s curry delicious—in fact very delicious! On to the food, Fish Amok, Cambodia’s National dish is cooked in kroueng paste (or curry) with coconut milk. Since it’s the national dish, it’s a must try (even if it sounded too ominous for my taste buds). 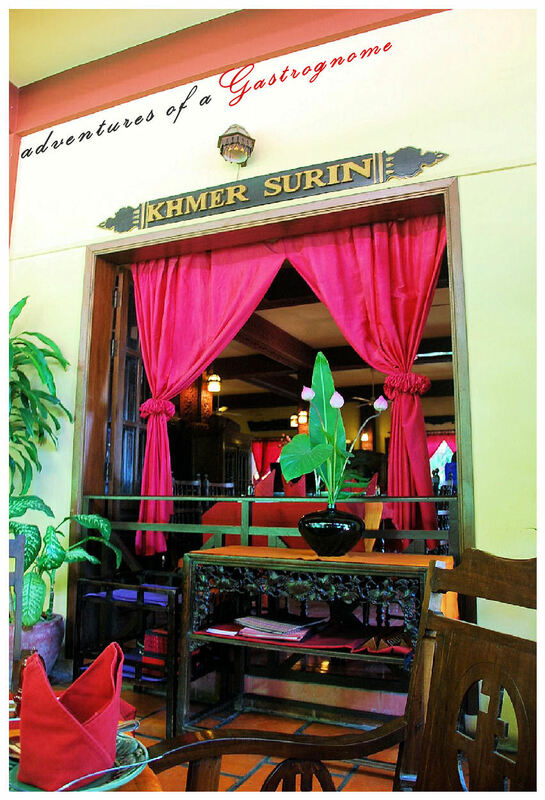 Searching for restaurants with the best amok, I found Khmer Surin Restaurant. 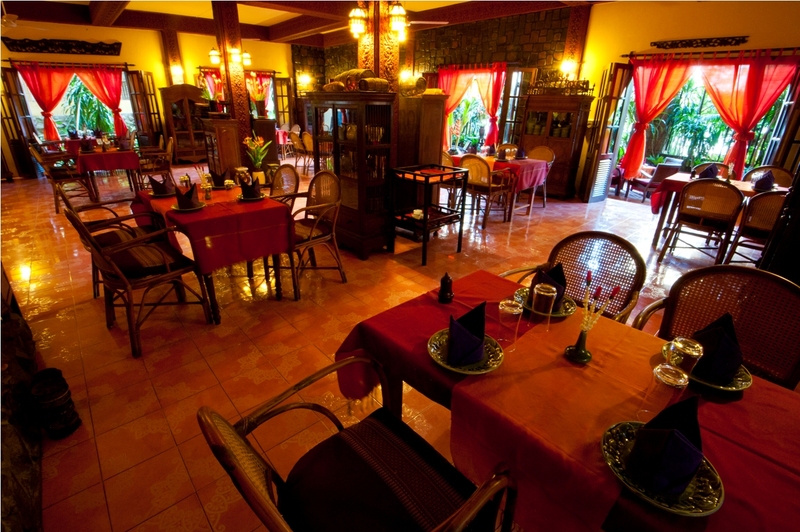 Khmer Surin is a 3-storey building with a 10-room guesthouse and 2 restaurants. 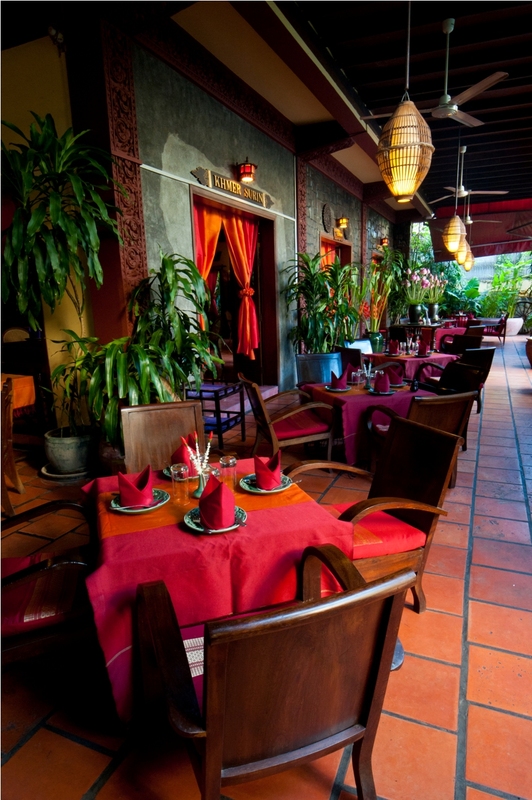 The main restaurant is the Khmer Surin while the other is the South Gate Restaurant. Khmer Surin’s ambiance is impressive, like royalty. 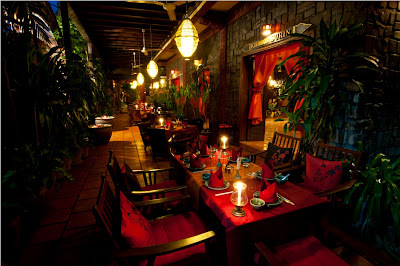 The theme is old Khmer style with antique furnitures and colorful silk in a lush, tranquil garden. The furnitures also differ; some are made from rattan, while some are wood. Khmer Surin Restaurant is also divided into 3 unique settings, which is ideally, located in its 3 floors. 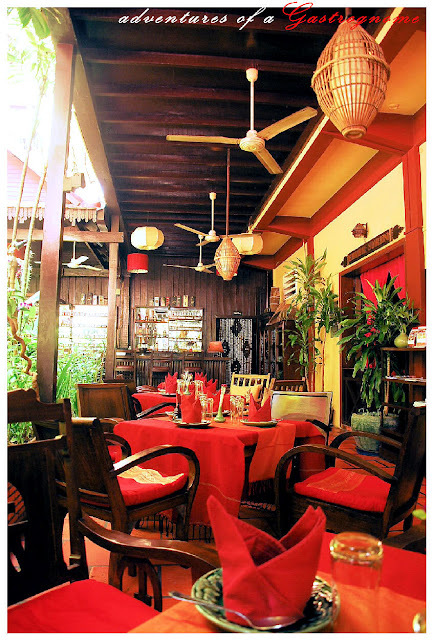 The 1st floor is a low table seating in lush garden; the 2nd floor is Cambodian style, sitting in cushions; while the 3rd floor is in an open air setting. Green Mango Salad with Catfish. A Thai appetizer with a Khmer twist. In Thai, the catfish is fluffed then fried to a crisp while in Khmer, there are strips which is a bit hard to chew. Also, the Khmer version is a little too salty for my taste. Fish Amok. $5.00. 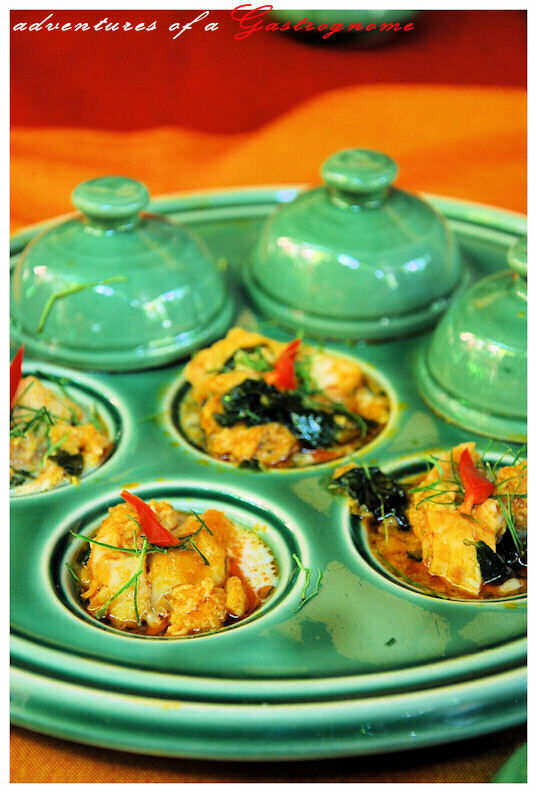 Fish Amok is a curry steamed in banana leaf. Usually, catfish is used, steamed in coconut milk with curry paste, lemongrass, kaffir leaves, galangal, fish sauce and dried chilis. Egg is also added to have a thick consistency then topped with coconut cream. Khmer Surin’s fish amok is very flavorful and creamy, the best amok I’ve had in Cambodia. I tried 3 amoks, all from restaurants famous for their amoks, but Khmer Surin’s was way too good than the other 2. I also ordered fresh coconut and a bowl of rice. 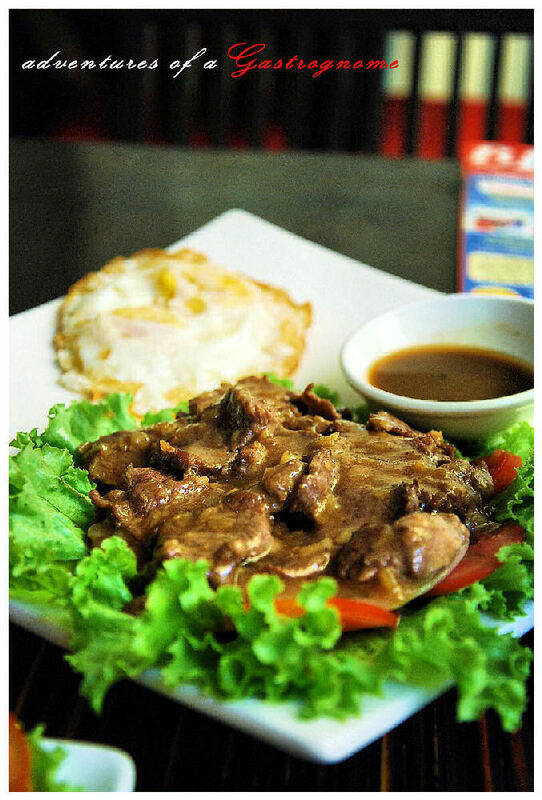 My total bill was $13, around P550.00, for a well-spent meal in my budget backpacking trip. After paying for it, I was anticipating dinner—wondering what my next Khmer food will be. Look like a very pleasant place, tables are also placed in a very attractive way. 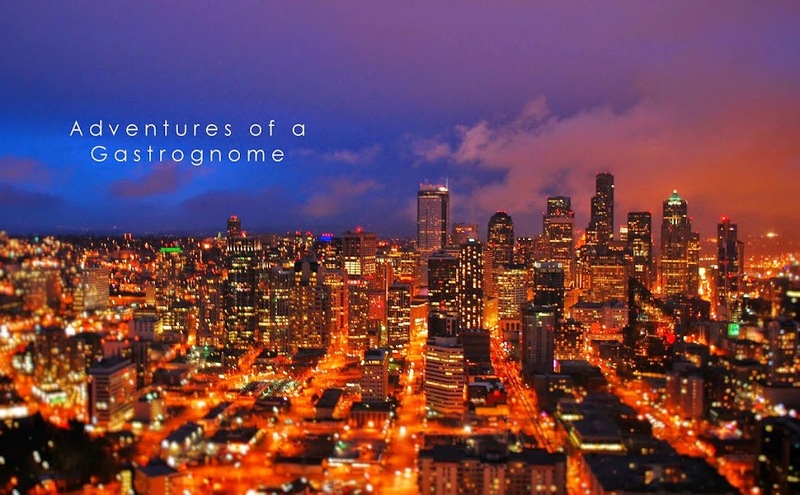 I will definitely visit there soon. Peaceful place and I believe a paradise for gourmet. If they have Kampot pepper and best amok in town.. Let's go!